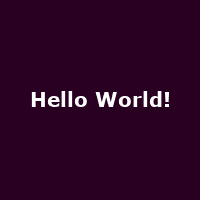 "Hello World! was a brand new event for 2017. From the creatives behind the MTV VMAs, this world-first event brings together the biggest digital stars on the planet including Caspar Lee, Jim Chapman, Joe Sugg, Louise Pentland, Marcus Butler, K.S.I, PointlessBlog, Rose and Rosie and Zoella - all together under one roof for the very first time."